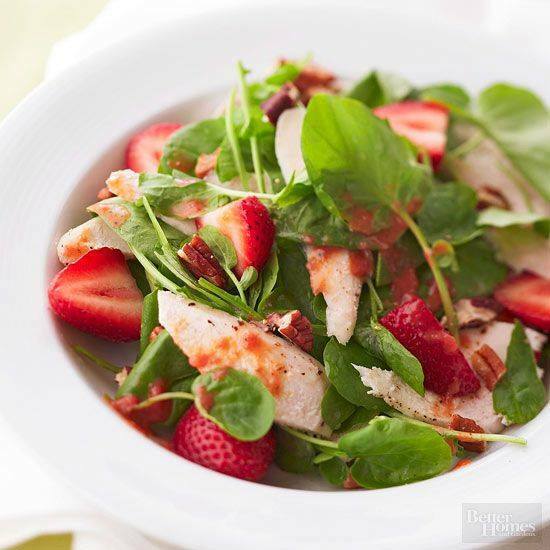 Toss together strawberries, sugar, vinegar, salt and pepper in a bowl. Let stand 15 minutes. Transfer the strawberry mixture to a blender and process until smooth, about 30 seconds. Start blender on low setting and gradually add olive oil in a slow, steady stream. Return mixture to bowl and whisk in poppy seeds. Put all of the salad ingredients in a large bowl, add dressing and toss together.